The Sacramento Tribe, managed by Ken Chavez, has won six of the last seven Kickoff Classics. 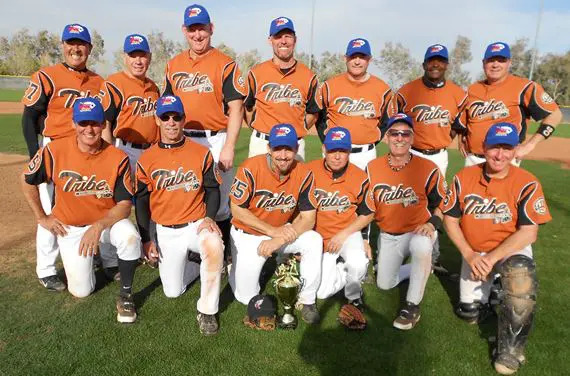 Las Vegas, Nev., March 5, 2012 – Carlos Bryson threw his second complete game of the tournament and got plenty of support from his offense as Ken Chavez’ Sacramento Tribe defeated the So Cal Fire 12-5 to claim the MSBL Kickoff Classic 55-and-over title. Bryson held So Cal to one run after the fourth inning and allowed 10 hits on the day. It was the Tribe’s sixth Kickoff title in the last seven years at the MSBL baseball tournament. The Tribe pounded the ball all day long collecting 17 hits. Darryll Foster was 2-for-4with two doubles, two stolen bases and a run scored, Chavez went 2-for-4 with two RBIs and Tim Burkitt and Mike Thatcher added two hits apiece while Phil Gelhaus added three hits. Sacramento flew out of the gate with four runs in the bottom of the first inning to take a 4-1 lead, but the Fire tied it up with a three-run fourth inning rally – and that’s when Bryson took over. He allowed just one run the rest of the way while his offense proceeded to score three times each in the fifth and sixth, added an insurance run in the bottom of the seventh. The Tribe’s ability to take advantage of opponent mistakes and other opportunities was the key to the title. “We’ve had a lot of games where the score wasn’t really indicative of how the game really went,” Chavez said. “Most of the time the games were close and we had the tendency to take advantage of some mistakes and in turn it opened the floodgates to big innings which put the game away.” He said. In addition to winning its sixth Kickoff title in the last seven years, it was the Tribe’s ninth finals appearance in a row. “This is always a great feeling, it never gets old,” Chavez said. “We’ve got a great core of guys here, it’s like a family, we all like each other, we support one another, it’s a great group.” He said. Chavez was especially proud of his pitching staff, who despite being shorthanded still made the best of the situation. “The pitching in this tournament was outstanding, we only had four pitchers available and we ended up getting five complete games, including Carlos (Bryson) who threw two complete games.” He said. Fire skipper Ron Lovell could only tip his cap to the Tribe. “We just played a better team today, our pitching wasn’t sharp, we didn’t get the hits when we needed them, these games happen.” He said. Juan Galino went 2 for 3 for the Fire. WP – Carlos Bryson, LP – Wayne Brenden. Leading Hitters – (Fire) Galino, 2×3. (Tribe) Foster 2×4; Chavez 2×4, 2RBI; Burkitt 2×4; Thatcher 2×3; Gelhaus 3×5. 2B – Foster (2).